Every morning lately I’ve been waking up with the “Still Hungry” chorus playing in my head. Does this mean I’ve been spending too much time at the Phantoms? Or is it a sign that my new diet is slowly killing me? Likely it’s both. But I am hungry for wins. It sure felt good getting one Wednesday night 3-1 from a solid Springfield team. 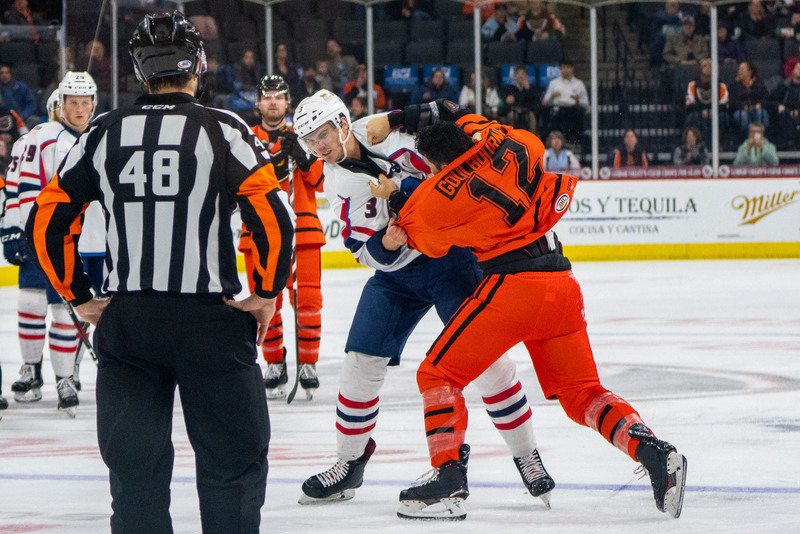 Last night in Hartford the team kept battling back, but a late penalty assured that the entire overtime would be a WolfPack power play, and they quickly converted it leaving us with but the one point in a 5-6 OT loss. Still, they battled some despite a rusty Stolie and a defensive effort that Coach Huffman had harsh words for afterwards. The margin of standings points between first-place Charlotte and second-place Bridgeport is larger (13) than the margin between Bridgeport and last-place Hershey (12). Scranton lost last night and are technically in 7th place if you go by PCT. 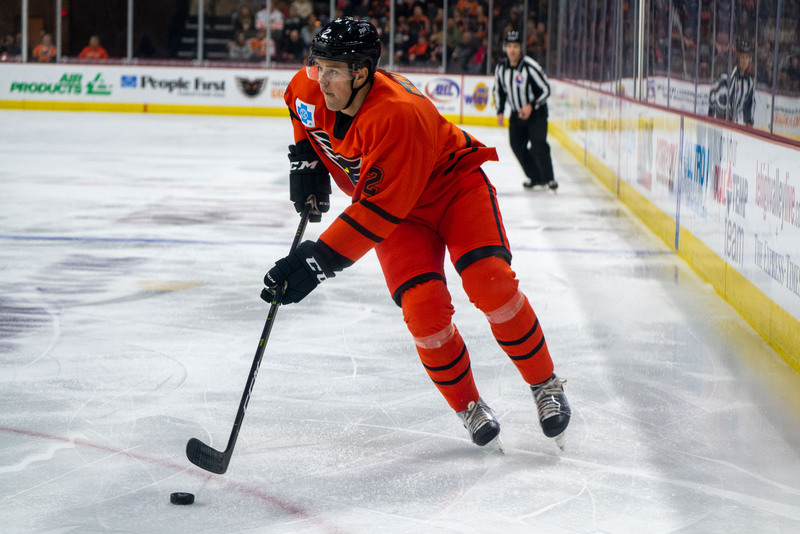 The Taylor Leier trade shook the Phantoms world a bit Thursday night. He’s off to Rochester of the Buffalo organization (hey, look who we play tonight!) in exchange for fellow-forward Justin Bailey. It was a trade, perhaps, of two forwards who weren’t in the future plans for their parent clubs and might benefit from a change of scenery. 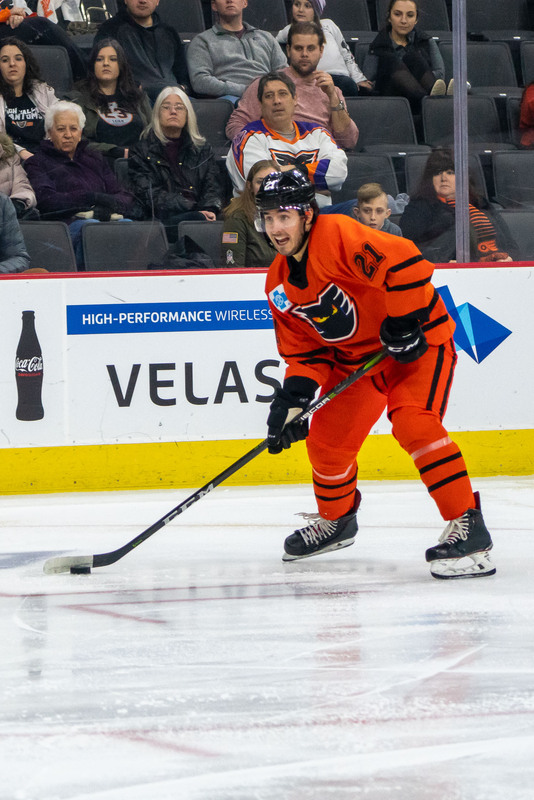 Certainly, Leier was one of the original Phantoms and had many fans around the arena every night, and he was also starting to really feel his game again after getting #1 star on Wednesday night–saying afterwards that he was back to a point where he really wanted the puck on his stick as much as possible, again. So it’s a blow to lose him, but if he really had no opportunity whatsoever with the Flyers, it’s certainly better for him to get to a situation where he has that chance to get back to the NHL. While their stats this season are similar, Bailey is the bigger player and is a RH shot rather than LH, which may be of use to the Flyers as a fourth-line guy. Bailey really skates well for a big guy, which he demonstrated in last night’s game, getting involved in the setup to a couple goals even where it doesn’t show up on the score sheet. Bailey will wear #28 for the Phantoms. 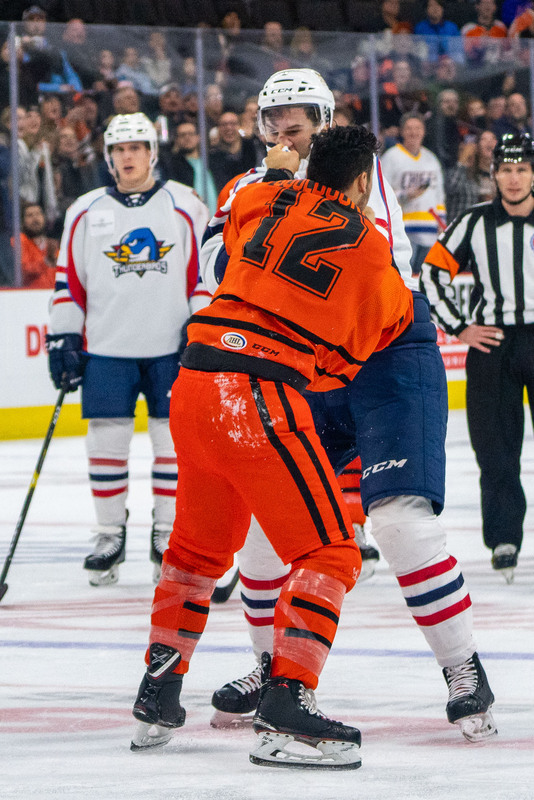 Look for Leier in #16 for Rochester–he didn’t dress last night as Rochester pummeled Wilkes-Barre. F Cole Bardreau and F David Kaše remain out. It will be a few weeks before Cole has the chance to come back–perhaps closer to the end of the season, which is what I originally surmised by the medical. Kaše may be back on skates soon, but it will be a bit before contact and game play, certainly. His injury has never been described, that I’ve seen. 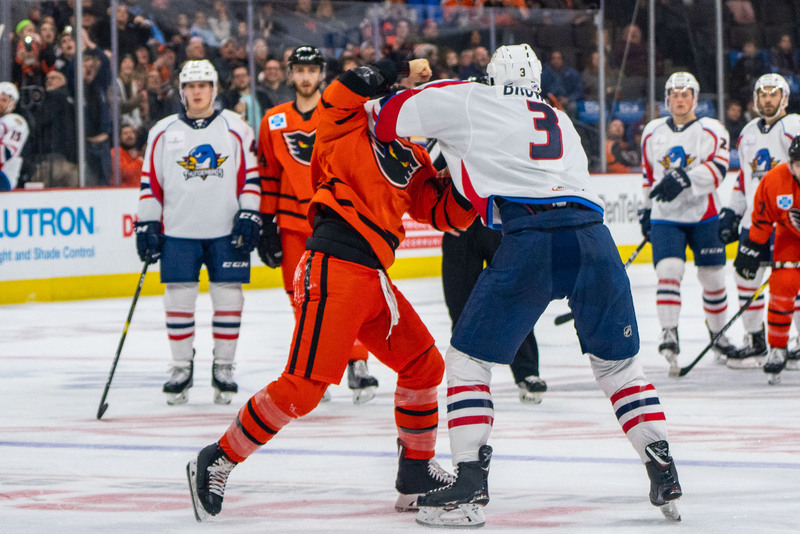 Prior to the Flyers practice on Friday morning, Flyers Executive Vice President and General Manager Chuck Fletcher gave an injury update regarding four Flyers. Elliott last appeared in the Flyers-Devils game on Nov. 15 and has missed 29 games due to injury this season. He has a 6-7-0 record with a 2.59 goals-against average and .911 save percentage in 14 appearances. 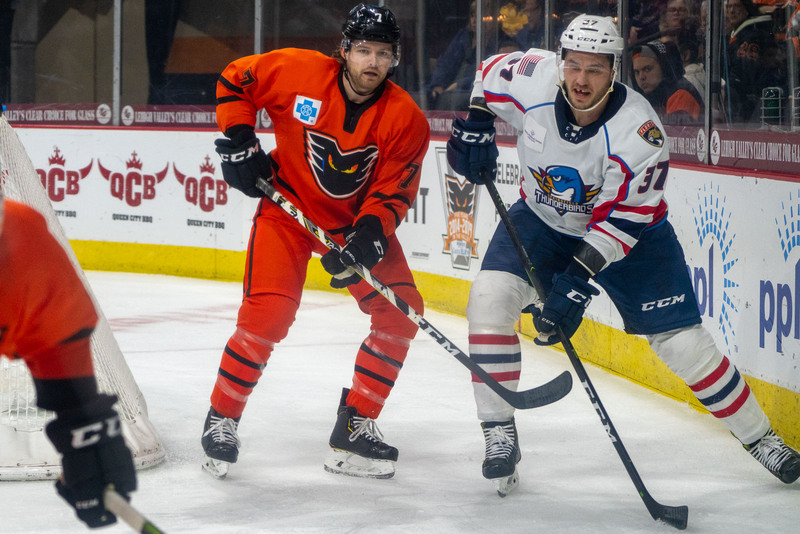 Morin has missed the entire 2018-19 season following surgery to repair a torn ACL suffered in Game 4 of the Lehigh Valley Phantoms’ second-round playoff series with the Charlotte Checkers on May 9, 2018. G Anthony Stolarz is in town on a conditioning stint for 14 days. He played last night, and could get three more games. With Elliott and Neuvirth on the mend, the Flyers will have some decisions to make. 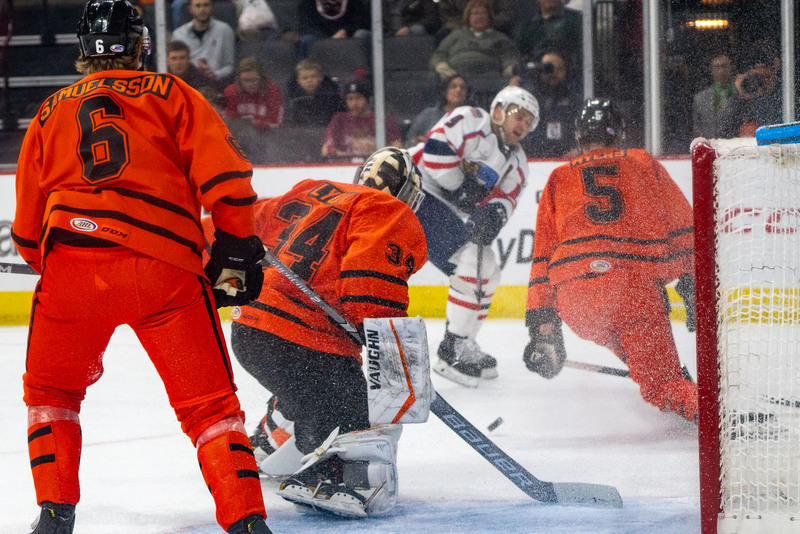 Komm is back in Reading right now, and somewhere in there if the waivers work out OK we could sure use a back-up for Alex Lyon–Stolie or McKenna? We’ll see–it’s also likely that they want to really find out what Stolie has in the NHL at some point. They’re saying we could see a start from Carter Hart, too, during the “bye week” the Flyers have coming up. We’ll see–Hart won’t be back for more than that, though, he’s held his own and the Flyers’ situation dictates that he should continue his development on that level. 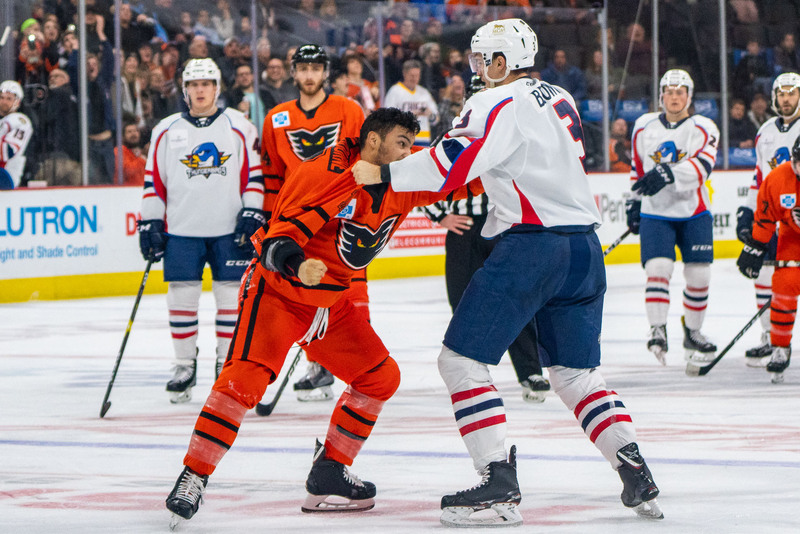 Morin and Knight could see conditioning stints with the Phantoms as well. I’m thinking they wait until after the All Star break to start those 14-day clocks. F Dale Weise didn’t make the trip for the Flyers–stayed behind in Voorhees. He’s passed through waivers, and I think they’re just avoiding sending him down at this point. And even if you do see the move, we’ll have to question whether it’s legit or just on paper. The snow show must go on! 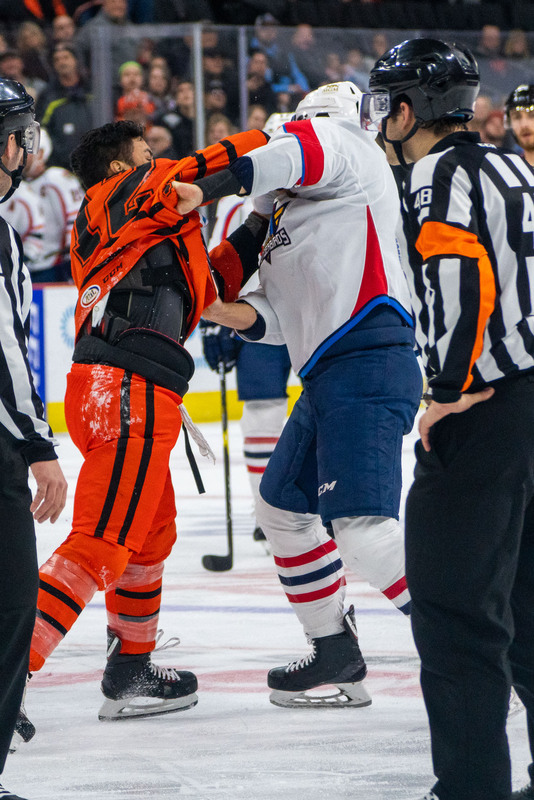 Rochester was in Wilkes-Barre, and we were in Hartford, and the officials should have been nearby as well. Assuming all are in town, we’ll be playing hockey tonight even if it’s in front of an empty arena. If this is a partial crowd tonight, but 10x rowdier than normal? That could be a lot of fun. I’m just saying. Oh, and they’re not moving the game time. The ice is being used for a tournament today earlier, so there’s no way. Game on 7:05PM, or as soon as they can get the puck down thereafter. And it’s Star Wars Night with a Hoth theme. A poster giveaway is planned. Weather: As you’ve no doubt heard, snow and ice are on their way in from the south/west. It should start 3-4PM with snow, and may become more of a mix or rain/ice around 10PM. I’ll be near downtown anyway at 3PM, so my strategy is going to be to find a nice parking place in a deck, under cover, and camp out downtown until the game. If the ice can hold off until after the game, that will allow me to make it home, as my car does really well in the snow, and I assume the roads will be addressed properly. ‘Merks: Rochester is in first place in the North division right now. They’re led by #22 D Zach Redmond, #19 LW C.J. Smith, #12 LW Victor Olofsson, #92 RW Alex Nylander, and #10 RW Wayne Simpson. You may recognize #11 C Kevin Porter. #29 Scott Wedgewood is their chief netminder, while #32 Adam Wilcox plays plenty as well. Wedgewood played last night versus the Penguins. Back to watching the goalie! I’m expecting Alex Lyon in net tonight, of course, not needing to push Stolie two nights in a row. Look for Stolie Monday in Wilkes-Barre? Yeah, they love him up there! Oh, and Lyon’s been solid–but does the return of Stolie push him at all? Parking. The decks will be packed. Not only because it’s the best choice for hockey, but residents usually get special access in order to keep cars off the street and it’s desirable for them, too. Arrive a little early if you’re going. Soft. Coach Huffman called his defense out last night after the game. He called them soft. Look for that to get rectified forthwith. I hope. It probably includes the attackers being responsible in their own end as well. Special Teams. And, hopefully, non-soft defense doesn’t result in a plurality of penalties. Winning the special teams match-ups is again a theme for tonight, and key to the game for the Phantoms. #28. Our first home look at Justin Bailey as a Phantom. He played on the left wing last night, and might be back there again. He can also play on the other side so I wouldn’t be surprised if things get jumbled a bit. Lines and pairs. Can D TJ Brennan return from his illness? Will Bailey continue on the left wing? Will Colin McDonald continue on that line, where he put up some points last night? The crowd. Watch to see how many show up tonight. Like I said above, it could be one of those epic games like following a rain delay at baseball when everyone leaves. Will we end up moving seats? Will we have more opportunity to get under the skin of the ‘merks? It’s all in play tonight! NAK. Seems like he’s been quiet a bit lately. No Varone and now no Leier, we need him to be his best self right now. And, it’ll probably get him to the NHL, too. The team will be happy to stay home tomorrow as they get a day off, and the snow and ice will get addressed. On Monday they head up to the Mohegan Sun in Wilkes-Barre for an MLK-Day Matinee. We’re right back here on Wednesday for Hershey, and Friday for Laval on racing night with a warm-up jersey and auction. 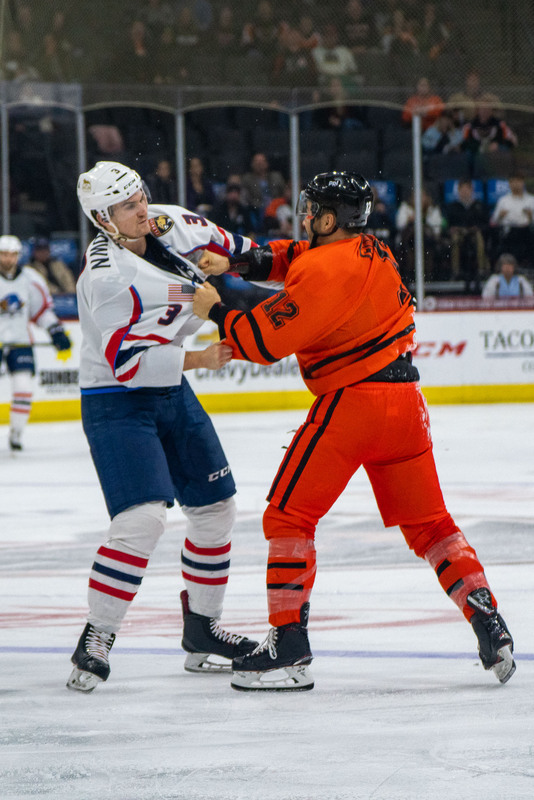 Here’s the fight sequence from Wednesday through the lens of Jack Mitroka. Please do not steal the photos; they belong to him. Just for the record, I love the trade. 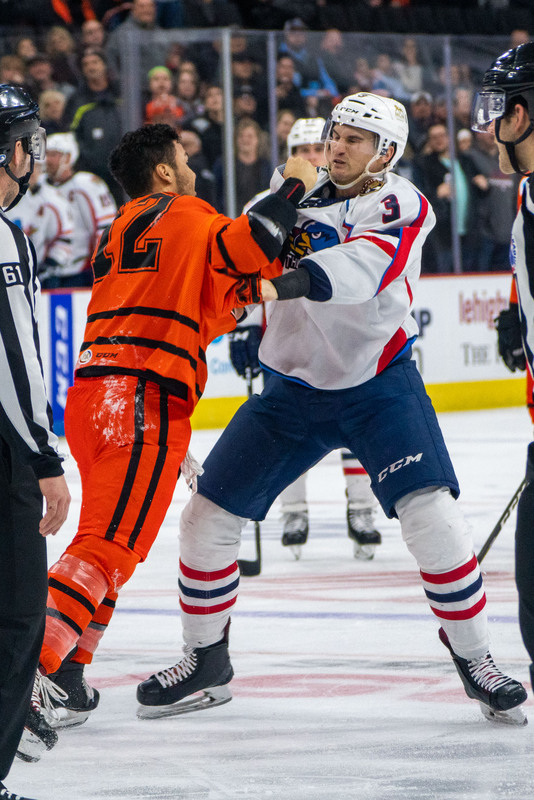 Nothing against Leier, but I like Bailey better for the Phantoms. 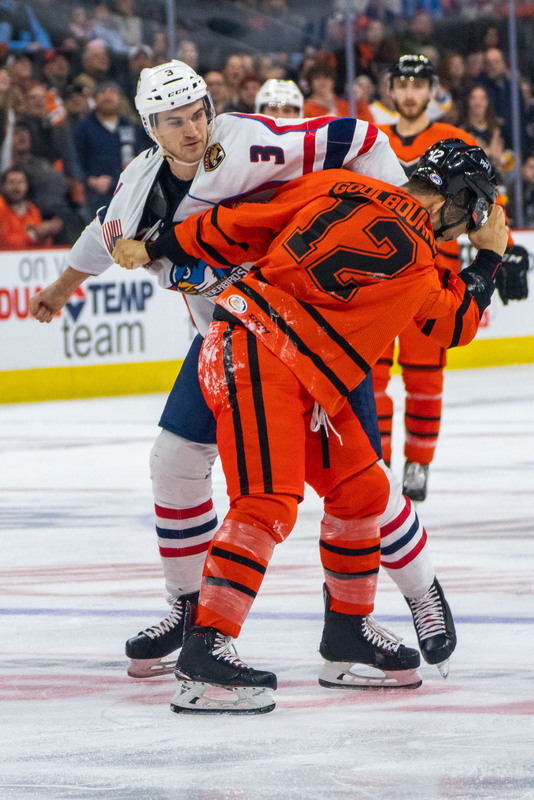 There are always a couple guys around the league that I watch and imagine them bringing their particular “game” to the Phantoms. Colin McDonald was one of those guys when he played in Bridgeport. The same with Varone in Bingo. Hated playing against them, but at the same time admiring their talents. Going back a few years, I thought the same thing when Michael Leighton was tending the Norfolk nets. Looking ahead, (don’t kill me for this) I would welcome Liam O’Brien with open arms if he ever departs Chocolate Town. Leier, in my eyes, was never going to get another shot with the Flyers. Is there an appreciable difference between him, NAK and Kase? 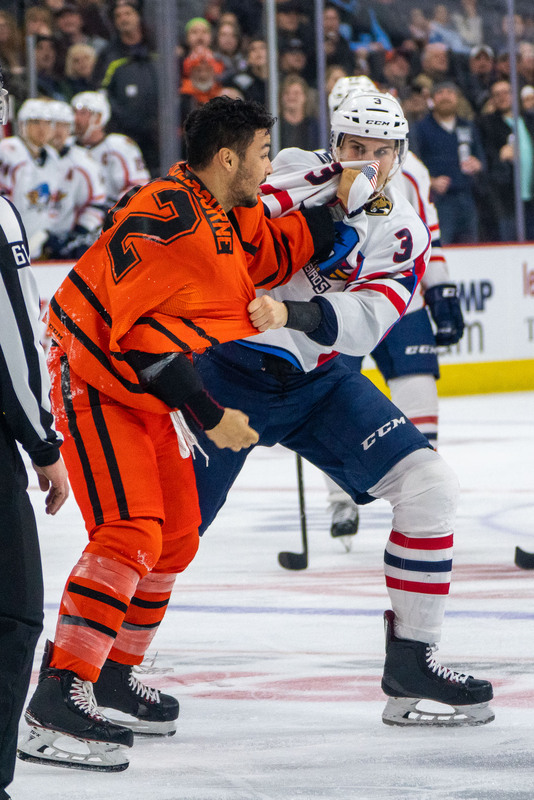 All about 5’11”, good speed, middling scoring ability at the AHL level, some aggitating tendencies and nothing exceptional that sets them apart. Maybe Leier gets another shot in Buffalo, maybe not. I have to believe that there will be opportunities for him in western NY that aren’t available here. Game #21 tonight. Does anyone remember NAK’s original number with the Phantoms?